While word spreads of the 'Fire Glen Sather' rally at The Garden (see post below) I simply ask. Is there is something in the air? The country collectively got a candidate named Barack Obama into the President's seat, so maybe this little rally is a small microcosm of the same political power of the people. One can only hope. The Dark Ranger will be there. We are tired of the 'spoon fed' hockey goo shoved down our throats, the rising ticket prices, good loyal paying season-ticket holders who are stuck with tickets that nobody wants, allowing non-season ticket holders to pay money to be 'THE OFFICIAL FANS OF BLUESHIRT UNITED offering perks and events that season-ticket-holders do not have access to, and the rag-tag assembled teams that never have more than a season to gel as a team, which might explain why we don't have any consistency as a franchise. Things will change when we don't purchase the playoff tickets if they make it. Things will change when we don't renew our seats for 2011. Things are already changing with the empty and unpaid-for corporate seats, and next year will be worse. Things will change when we stop listening to Joe & Sam. Our only leverage is to walk away from our commitment to you. The Rangers FanMisery.com Index App chronicles the day-to-day exploits of the Rangers – a team that has a fanatical fan base of historic proportions. It’s more than just an interest – it’s an abiding fascination, skipping over into love. An obsession passed from generation to generation. It’s painful, bordering on ridiculously painful at times. It makes the heart pump and adrenaline flow. But, no matter what happens on or off the ice, your passion is renewed each and every time you even think about a game at the Garden. A unique set of statistics, opinions, and news provides you with insight into what is going on with the Rangers – on and off the ice – and your level of misery or bliss – as a Rangers fan. It's not quite the iPad announcement from this afternoon, but depending on the level of abuse you can take as a Blueshirts' fan (watching the games are enough for me) try out the app and let us know if this is something we should all get to make ourselves feel better. Maybe change will come in the form of a win tonight!!? Anyway, I love our team. That is what it means to be a fan. You can like Glen Sather or you can despise the guy. Maybe you like a losing team. Who cares? But I think (and the readers of DARK) feel someone needs to be held accountable for these post-lockout Blues, fellow Blueshirts. I say we start with Slats! You? You could post your "spoon fed" paragraph on the front door to the arena just like Martin Luther did hundreds of years ago. 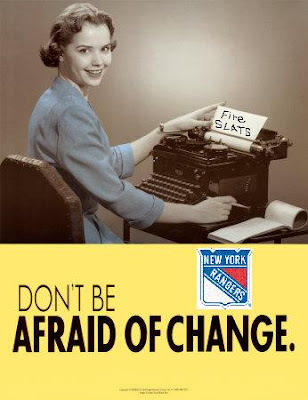 You have published the Ranger Fans Manifesto and to that I say, hear, hear! Tonight was horrible. Things will change. I second your call to rally. Enough. Enough. Enough. Thanks Tony. 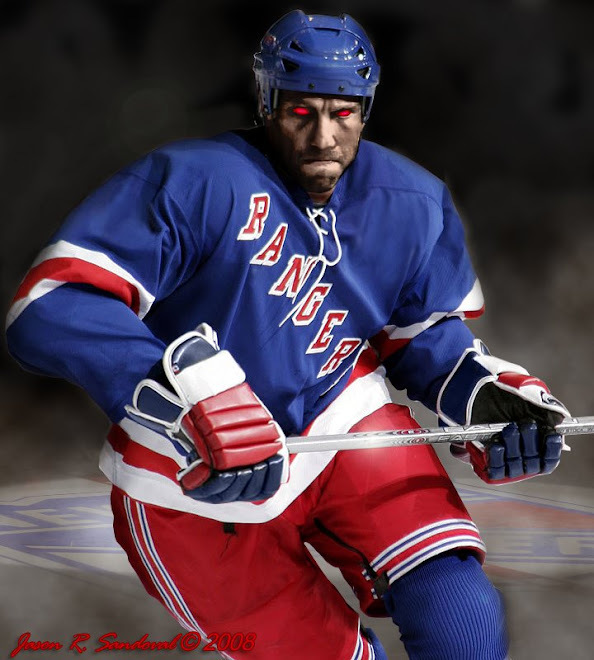 Maybe the official Ranger Fans' Manifesto is coming, especially after tonight's delicious performance. THIS GAME WAS THE END OF AN ERA. PLEASE, PLEASE PLEASE MAKE THIS STOP. THE WESTERN TEAMS ARE GOING TO SLAUGHTER US. Please kill me now. The rangers stuck up the joint vs Carolina. I want my money back. Great writing - you really nailed it. The iPhone App you mentioned - the Rangers FanMisery.com Index App - is a great idea - pretty cool and definitely worth $2.99 - but, I'm a fan. I always have been and I always will be. I also grabbed the Yankees and Giants Football FanMisery.com Index Apps. The Yankees fan misery index today is 1.6! Better days will come for Rangers fans!